Religion would soon overcome the crisis of the civilization of materialist values of life. In this context, the Islamic economy will be the subject of study. Consumerism and craze for ornaments and property are some of the vices that go to precurse hatred and violence in living. Islamic economics in its economic philosophy would root out these vices. Its mechanism is in interest-free loans. If interest disappears in the economy, its morphology will be qualitatively different. It would be a convulsive change. Righteous values of living and the preference for eternal bliss have been underpinned in Holy Quran. Accordingly, output and employment will be calibrated. Irreversible trend would be experienced in market prices in free competition. 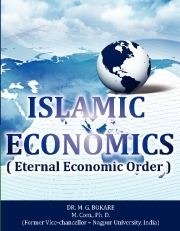 Islamic economy will be a civilization of downward moving prices. Increasing purchasing power of money is the clue to cure the vices of interest. Other legislative prescriptions in the policy will cause disappearance of interest. Theorization of savings, investments, gainful employment of all citizens in the workforce has to overcome the conventional analysis. Thus Islam realized is the consummation of peace for mankind. Dr. M G Bokare (1926-2001) was educated in GS College of Commerce & Economics at Wardha and Nagpur for Master of Commerce and Ph. D. He was teaching economics in same college to graduate and post-grad students and guide for doctorate level theses. He served as Vice Chancellor of Nagpur University for two years. He held other positions like: Member- Advisory Council of economists of Planning commission, Govt. of India; State Planning Board of Maharashtra; Agricultural Price Committee, Govt. of India; Maharashtra State Electricity Board; Maharashtra State Secondary Education Board; Convener: National Committee of Swadeshi Jagran Manch, New Delhi; Pioneered farmers’ movement for prices based on cost of production, now manifested in Maharashtra State Monopoly Scheme; Association with Marxism and Gandhism for four decades; Author- Hindu Economics, Economic Theory of Sarvodaya, Reassessment of Marxism, Gandhivadi Arthashastra-Marathi, Let the Fittest Survive, Expenditure-based Income Tax, Stagflation-Its Cure, Swadeshi Economics-Principles and Programmes, The Taxless Economy etc.